St George’s is the parish church of Mayfair. Splendidly refurbished in 2010 it was built between 1721-1724 to the designs of John James, as one of the Fifty Churches projected by Queen Anne’s Act of 1711. The reredos is from the workshop of Grinling Gibbons and frames a ‘Last Supper’ painted for the church by William Kent in 1724. The windows contain Flemish glass of the early 16th century from Antwerp. 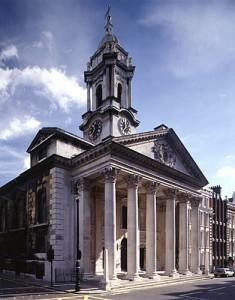 George Frederick Handel was a regular worshipper at St George’s, which is home to the annual London Handel Festival. We have a reputation for dignified and traditional formal worship based on the Book of Common Prayer, magnificent music provided by our fine professional choir, and thoughtful preaching. Here we worship Almighty God, who in the life, death and resurrection of Jesus Christ has turned His face toward the world in love. 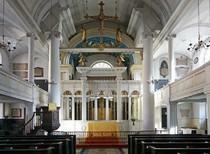 You are most welcome to join us and make St George’s your spiritual home. Welcome to the Grosvenor Chapel. The Chapel has served the parish of Mayfair since 1730, offering reverential worship with high quality music in the intimate and beautiful space of the Chapel, alongside exploratory and thoughtful preaching: “unafraid to reason, unashamed to adore”. As a witness to the light of Christ in the heart of Mayfair, we aim to serve working people through the week, local residents, visiting tourists and those who come to our Sunday Eucharist or wish to be married here. We have an active Sunday Club for children, which runs during term time, and a Parish Church School. We are part of the Church of England’s Diocese of London but also are delighted to have people from other Christian traditions as part of our family. We have a programme of Sunday studies, events, lunches, trips and concerts throughout the year and hope that you will come and join us. We try to be an open-minded, inclusive and welcoming community of faith.